Buy Enzymatic Therapy Osteoprime - 120 capsules in the UK from our online shop or directly from our independent Scottish store. If you want to automatically receive an email when 'Osteoprime 120 capsules' is back in stock, just leave your email address below. Bone is living tissue and needs calcium and other important nutrients to support healthy bones and teeth, and support healthy bone density. Calcium and other minerals are primary building blocks for bones. Bone is living tissue and needs calcium and other important nutrients to support healthy bones and teeth, and support healthy bone density. Since proper calcium intake can't always be met through diet alone, a supplement can offer support. If pregnant, nursing, or taking Coumadin®‡‡‡ (warfarin) or any medications, consult a healthcare professional before use. We sell real Osteoprime and other Joint & Bone Support directly from our shop in Scotland and online throughout the UK. View more products from Osteoprime. Where can you buy real Osteoprime 120 capsules safely online? 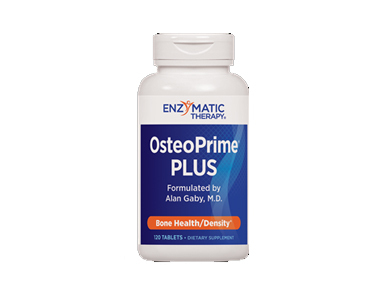 If you are wondering where you can buy Enzymatic Therapy Osteoprime - 120 capsules safely online in the UK, then shop with us. We are an actual health foods shop; with real people selling real foods and products. Our award-winning independent shop is located in Stirling, Scotland since 1976. You can buy our Joint & Bone Support in store or safely place an order with us online or over the phone. Osteoprime 120 capsules - Enzymatic Therapy Osteoprime - 120 capsules in Joint & Bone Support and Herbal Remedies, Tinctures & Supplements.